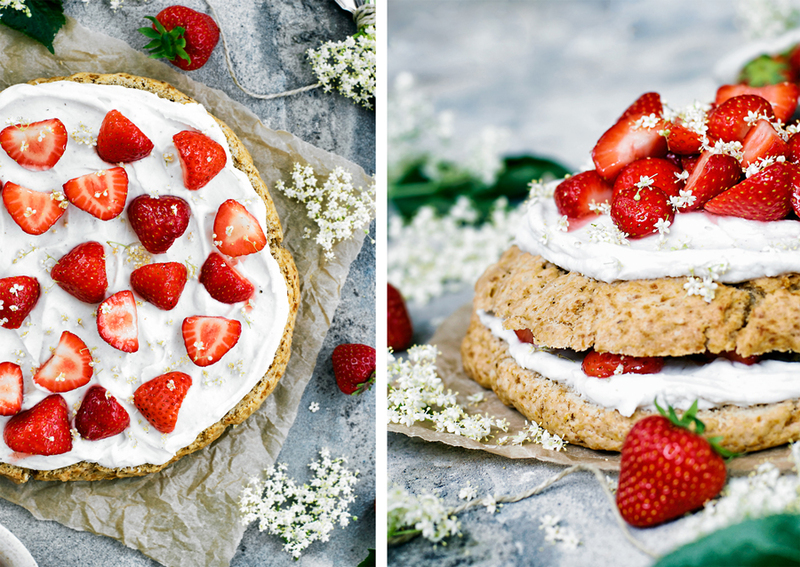 This giant vegan scone cake is flavoured with seasonal elderflower blossoms and strawberries for a very simple, beautiful spring dessert. If you can’t get elderflower, extra lemon zest makes a good substitute, or lilac blossoms. 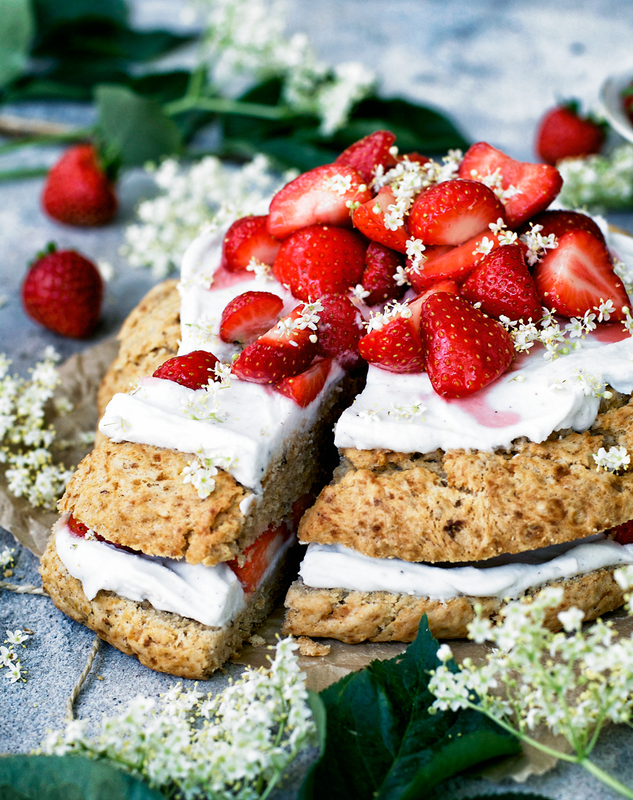 This vegan strawberry elderflower scone cake is the perfect way to use the elderflower blossoms that are all over the place at this time of year. Have you ever heard of a scone cake before? I hadn’t, but it’s my new favourite thing. 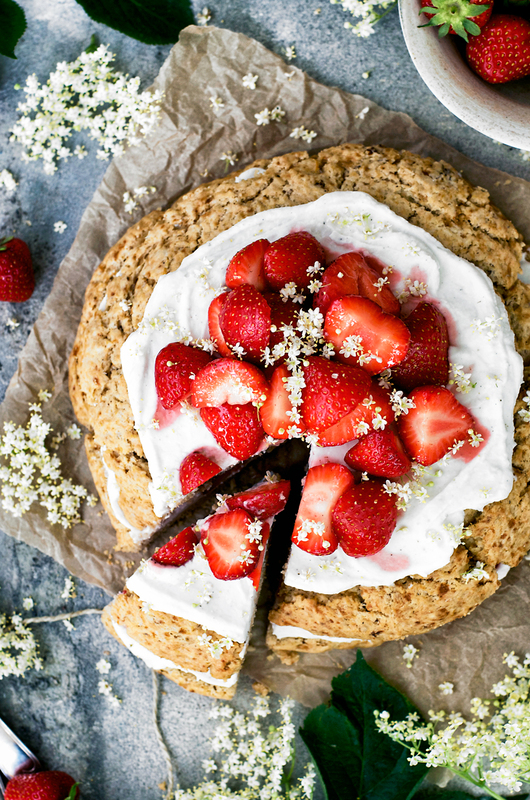 Beautiful elderflower and seasonal strawberries taste perfect together and it’s a stunning cake that’s surprisingly easy to make. It’s just too pretty. I didn’t really plan to post this recipe. We try to go on walks or bike rides every evening when the weather is nice, and we were biking through a park near our house when I found what I thought was elderflower. I asked to make sure that I wasn’t picking some horribly poisonous plant (Sophie’s advice was to look for bugs collecting around the flowers and a strong sweet scent), then went back the next evening to pick some more to use in a recipe. Turns out elderflower should be used right after it’s picked. Most of it wilted completely overnight, so I cut some more from a tree across the street, hah. If you’ve ever eaten lilacs, elderflower has a similar citrus/floral flavour. It’s pleasant in small amounts but I think it could easily become overpowering. 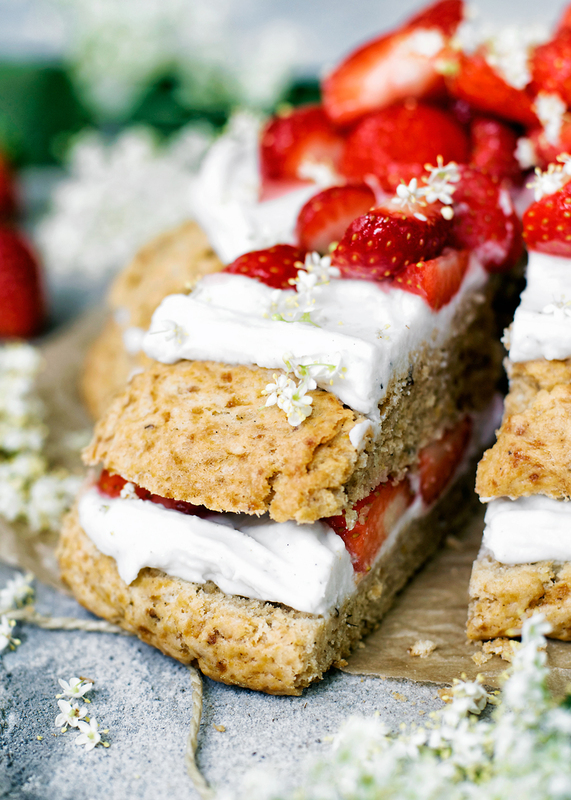 In this case, some elderflower is used in the giant scone that makes up the cake, and a little more is sprinkled on each layer for a subtle floral taste. 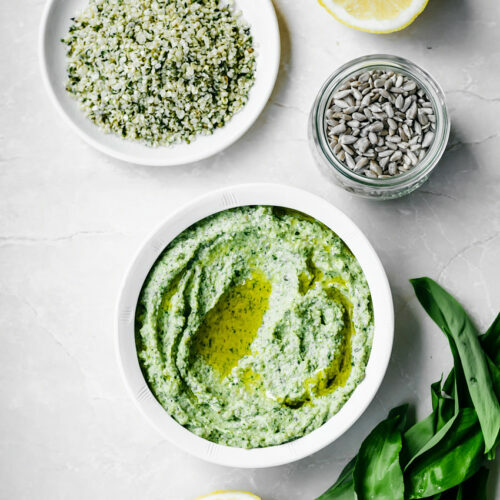 I loved it, and I recommend seeking some out to try in this recipe (just make sure you don’t pick the wrong plant). It’s not absolutely necessary if you can’t find it, and the cake will be delicious without it, but perhaps not quite as pretty. White lilac blossoms would be beautiful and just as tasty if you don’t have elderflower. I was thinking that I’d make little strawberry shortcake scones with elderflower, but remembered that I still haven’t made a damn biscuit cutter, so I shaped one big scone to see how it’d turn out. Turns out a giant scone cake is 1. much easier than cutting scones, and 2. very, very pretty. 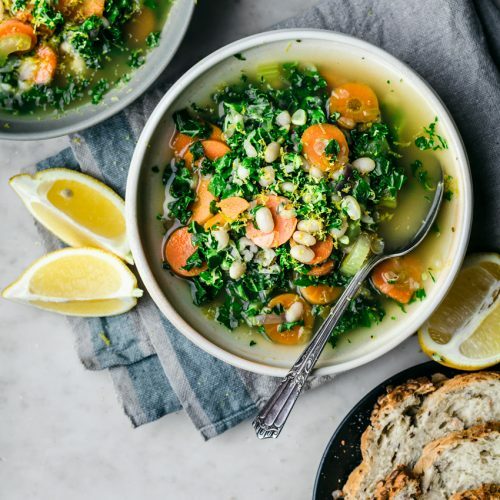 I imagined serving it at a baby shower or spring dinner party (as if I ever have dinner parties), but it’s also so simple that you can make it any time. The dough is made mostly in a food processor, the ingredient list is short and sweet, and since you don’t have to cut individual scones, it comes together quickly. You don’t need to roll or fold anything either. In terms of prep time, just remember that a can of coconut milk needs to go in the fridge the day before making the coconut whipped cream. There’s just a small amount of (coconut) sugar in the whole cake, but using fresh seasonal strawberries makes it sweet enough without being cloying. If you’d like, you can make the different elements of the cake a day in advance, and then assemble it right before serving. If you assemble it too early it won’t be as good – the cream may soak into the scone and make it too soft, and it’s not as nice after it’s been sitting in the fridge, even for a few hours. It’s a snap to assemble in just a few minutes as it doesn’t need to look perfect. Don’t let the fancy picture styling fool you, I put this cake together in about five minutes. It’s all the junk around it that took time. 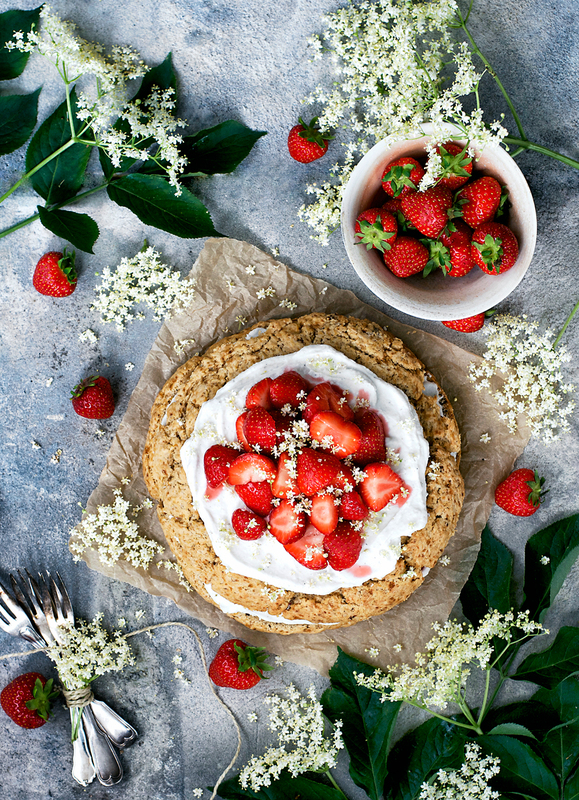 This giant vegan scone cake is flavoured with seasonal elderflower blossoms and strawberries for a very simple, beautiful spring dessert. If you can't get elderflower, extra lemon zest makes a good substitute, or lilac blossoms. Add the flour, sugar, baking powder, arrowroot, vanilla, and salt to the bowl of a food processor. Blend to combine, and then add the coconut oil. Pulse until the coconut oil is cut into small pieces and the mixture looks slightly sandy. Move the flour mixture into a mixing bowl. Add the coconut milk, elderflower blossoms, and lemon zest. Stir with a wooden spoon until just combined. The dough will be a little wetter than scone dough usually is, but that's normal. Take the dough out of the bowl and use your hands to form a rough ball, then place it on the prepared baking sheet. Press down with your hands to make a circle of dough that's about 5cm high. Use a light hand to keep the coconut oil from melting. Bake for 30-35 minutes, or until golden in colour. Let the scone cool on the baking sheet for 15 minutes before gently placing it on a rack to cool completely. It will be delicate while it's still warm. Once it's cool, cut it in half with a serrated knife. 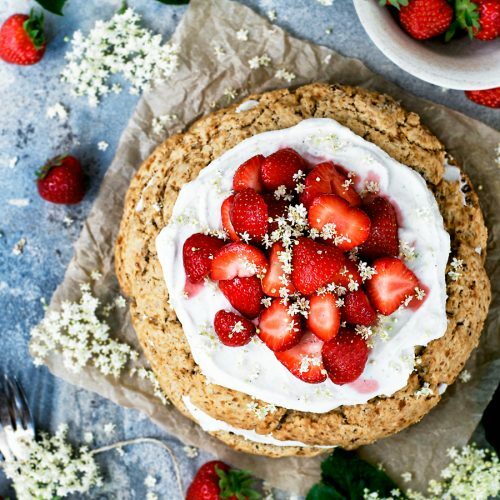 Use about half of the whipped cream and 1 cup of strawberries as filling in the centre, and sprinkle some more elderflower blossoms over it. Place the other half of the scone on top and then add the remaining cream and strawberries. Top with extra blossoms, and serve right away. Scoop the hardened cream from the can, leaving any remaining water (use this in smoothies). Add it to a mixing bowl with the honey and vanilla, then whip with an electric beater at a high speed until peaks form and it looks like whipped cream. Use immediately (it can harden again if refrigerated for longer than about half an hour). Wash the strawberries and remove the greens. Cut them in halves or quarters, depending on how big they are. Place the berries in a bowl with the honey and stir until they're coated. * Since this is a dessert, I wouldn't use more than half whole spelt flour. I use a similar base recipe for biscuits with whole spelt, but it will be a little tougher than if you just use light spelt. ** If your kitchen is very warm and your coconut oil has melted, measure out the 1/4 cup and spread it out onto parchment and pop it in the freezer for about ten minutes. *** Mix a little bit of the water from the canned coconut milk in with the cream to get the same consistency of whipping cream for your coconut milk in this recipe. **** I used one head of elderflower blossoms to get 2 tablespoons. • If you don't have a food processor, you can cut the coconut oil in with a pastry cutter or two knives, but using knives is deeply frustrating. 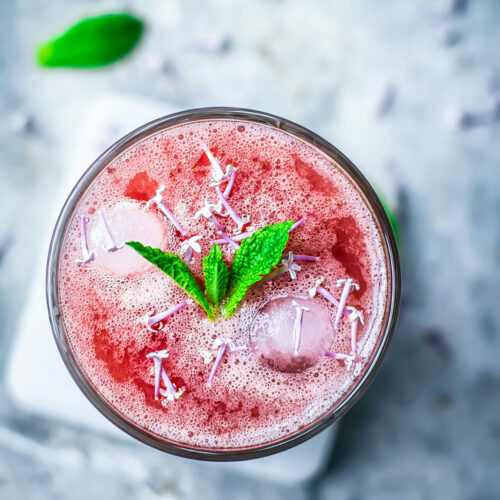 • Make sure to use a type of coconut milk that doesn't have added thickeners for the best results (in both the scone and the whipped cream). Some people swear by aroy-d brand, and I generally find that less expensive varieties work better. I use the denns brand here in Germany and it always works perfectly. • Always look for small, deep red strawberries. Smaller ones are sweeter than their large counterparts. Beautiful, Alexandra! So many edible flowers out there and so little time, it seems. This year, I had every chance to steal some of the neighbours Lilacs, but alas, I couldn't bring myself to do it (#goals). And, lol to "as if I hold dinner parties". I know, right? I have every good intention to hold one (someday). 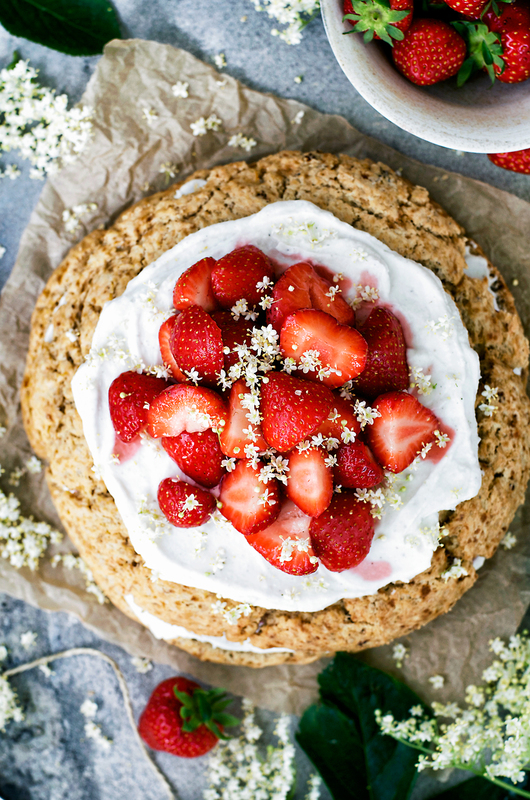 I have never tried elderflower, they look so pretty with the strawberries ! Spelt flour is one of my new discoveries and I prefer the both its texture and taste over whole wheat flour. I like how you sandwich some whipped cream in between, thanks for sharing ! So many incredible recipes lately, my dear — not sure which to make first! 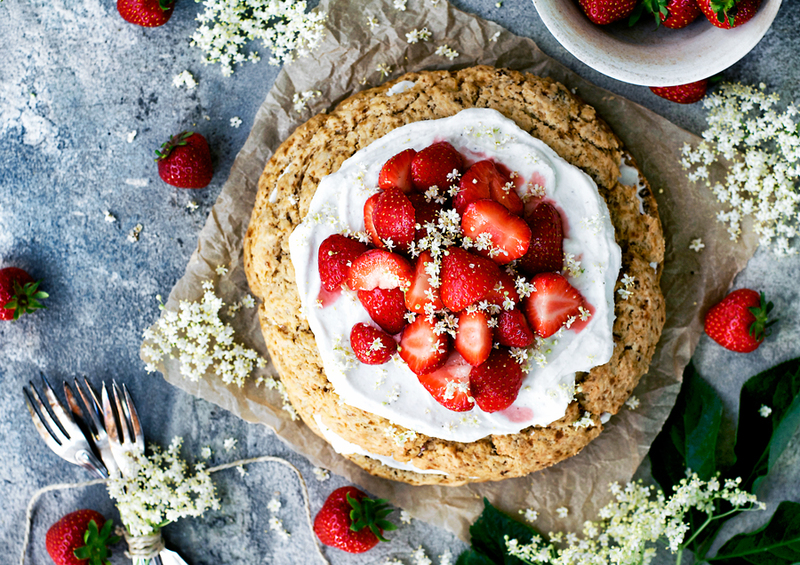 I love the idea of a shortcake/scone cake. OMG, this is an absolute dream. It's beautiful! My dear, you are absolutely genius for creating a scone cake! I am in love with this idea. I enjoy edible flowers, but am yet to try elderflower, but it's now on my radar. Also, your photography is gorgeous! 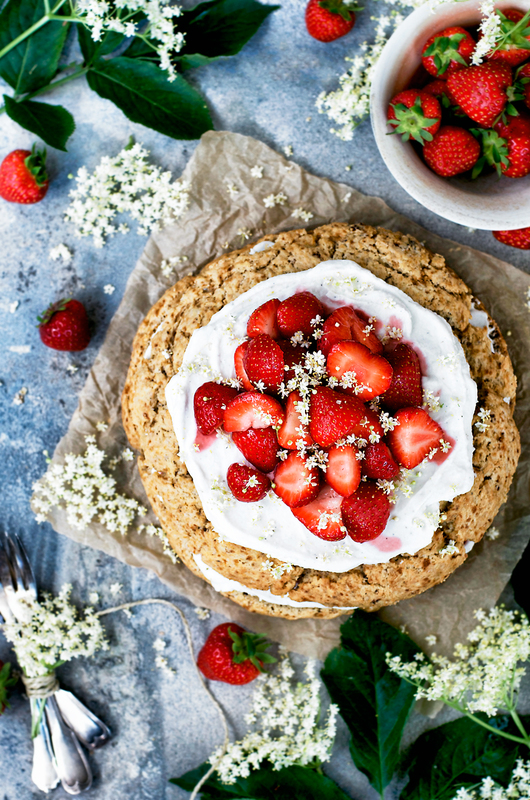 This scone cake looks DIVINE! 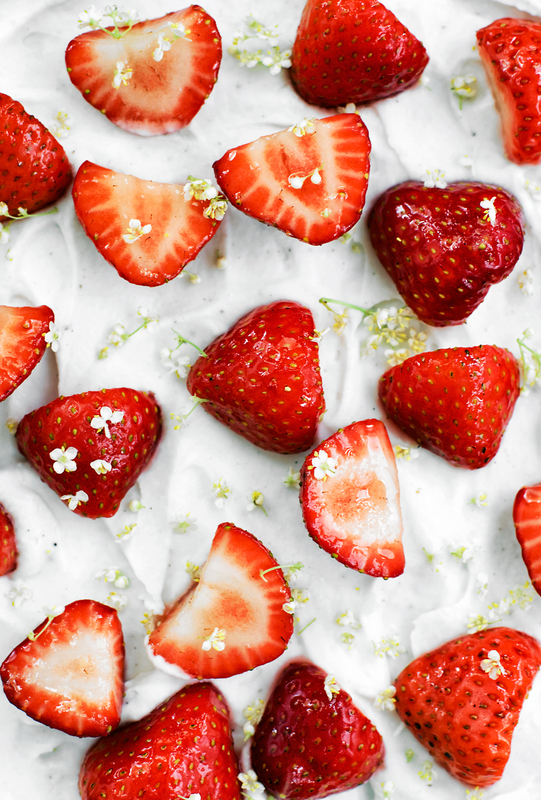 Not only is it downright beautiful, but that combo of elderflower and strawberry sounds like a match made in heaven!